A pedestrian walkway that was still under construction collapsed onto a busy highway in Miami on Thursday, killing at least four people. The Florida Highway Patrol said multiple vehicles were crushed by the span near Florida International University's campus when it came down at around 1:30 p.m. According to Miami-Dade County Fire Rescue, there were workers on the bridge and several cars underneath. At a press conference Thursday evening, Miami-Dade Fire Chief Dave Downey said that at least four people were killed by the collapse. The deceased have not been identified. Rescue operations remained ongoing, he said at the news conference. "We're going to continue to search this pile until we are sure that there's no other survivors," Downey said then. Miami-Dade Police Director Juan Perez said on Twitter late Thursday "Thank you first responders who assisted in the rescue efforts at the collapsed crossing bridge. Your efforts were valiant despite the final outcome." He said that police "will now begin the recovery of victims and investigation. We will get to the truth for the sake of the family." Miami-Dade Fire Rescue Division Chief Paul Estopinan had earlier said emergency workers found eight vehicles trapped under the bridge. "We could only see eight [vehicles] from the exterior of the bridge," Estopinan said, adding that he did not know how many total cars might be affected. "We are creating holes just so that we can physically see [if there are others]." The search and rescue effort included urban search and rescue teams and search dogs, heavy equipment and four cranes, officials said earlier. Ten patients were brought to the Kendall Regional Medical Center after the accident, the hospital said: Two were in critical condition and eight suffered minor injuries that ranged from bruises to broken bones. 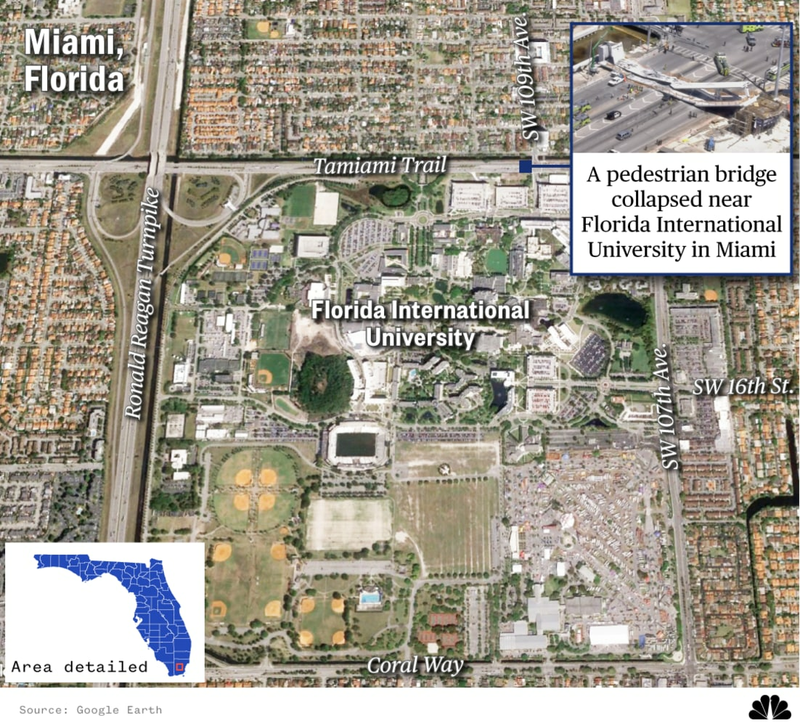 The walkway weighed 950 tons and was 174 feet long, according to FIU. The bridge was scheduled to open early next year and designed to withstand hurricane-force winds. Built across the seven-lane Tamiami Trail, the planned walkway connected the FIU campus to the town of Sweetwater where the university estimates some 4,000 students live. “We are shocked and saddened about the tragic events unfolding at the FIU-Sweetwater pedestrian bridge," the university said in a statement. “At this time we are still involved in rescue efforts and gathering information." The university had celebrated the unveiling of the walkway five days prior to the collapse. "This bridge was about collaboration and was about hope and determination," said FIU president Marc Rosenberg. Witnesses described watching the bridge collapse in front of them. "I was three seconds away from being under the bridge, but I looked forward. All of a sudden I saw the bridge collapse, and it started from the left side of the bridge and it really shocked me,” said Susie Bermudez. "There’s probably like seven or eight cars under the bridge so it was very shocking to me, and I’m very grateful to be alive,” she added. Jose Mejia, who lives in Sweetwater, told MSNBC that he heard a loud bang and then rushed to the scene with police where he saw numerous cars trapped under the bridge. "There was a young gentleman in a red Honda, and unfortunately there was nothing I could do, but he stuck his hand out and, at that point he passed away, he expired," Mejia said. Florida Gov. Rick Scott said he had spoken to Perez about the collapse and would remain "in constant communication with law enforcement throughout the day." Sen. Marco Rubio, R-Fla., who has taught at FIU as an adjunct professor, called it a "horrifying tragedy" and said he had spoken to Department of Transportation Secretary Elaine Chao and also planned to travel to the university. Scott and Rubio said there would be a thorough investigation. "There will be an exhaustive review that will give details at an engineering and scientific level," said Rubio. And there could be consequences. "If anyone has done anything wrong we will hold them accountable," said Scott, promising a transparent investigation. Meanwhile, White House Press Secretary Sarah Huckabee Sanders told reporters that President Donald Trump was aware of the bridge collapse and would provide government resources as needed. The National Transportation Safety Board said that it would send a 15-person team to investigate the collapse. The bridge was lifted off its temporary support and placed in its permanent position on Saturday. The $11.4 million bridge was meant to connect the school to the city of Sweetwater. It is part of a $124 million expansion of the campus. It was built and designed by Munilla Construction Management in partnership with FIGG Bridge Engineers, the college said. In a statement posted on Twitter, MCM said they would "conduct a full investigations to determine exactly went wrong." FIGG Bridge Engineers said they were stunned by the "tragic collapse" and would cooperate with the authorities as they investigated the matter. "In our 40-year history, nothing like this has ever happened before," the company said in a statement. "Our entire team mourns the loss of life and injuries associated with this devastating tragedy, and our prayers go out to all involved." The homicide bureau will take the lead in investigating the collapse and the state attorney will also work the case, said Perez, the police director. 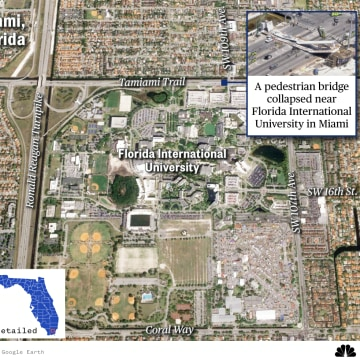 Rubio said that the bridge project was intended to save lives, and that last year an FIU student was killed while crossing the road. Perez warned there could be more casualties discovered. "This is going to be a long, long process, because to get through that rubble and, you know, the pieces of concrete that are laying there is not going to be an easy task,” he said. "Our prayers go out to all those impacted," Perez said. He said that despite the best efforts of the fire department, other rescuers and ordinary citizens who leaped in to help, "we're probably going to come out with a sad outcome for many in our communities."